If you’re looking for a appetizer to wow your guests (or just yourself!) this prosciutto recipe is for you. Who doesn’t love prosciutto-wrapped anything, but prosciutto wrapped cheese is a starter plate from heaven. Add the freshness and little bit of spice from the salsa verde, along with arugula and frisee, and this prosciutto recipe will be the talk of the party. 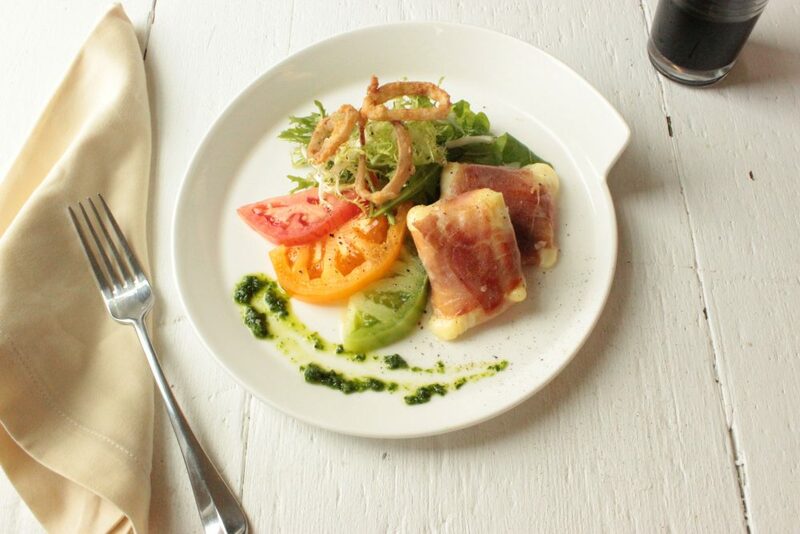 This Prosciutto Wrapped Tomino with Salsa Verde is excellent with a more fruity and old-fashioned glass of Lambrusco. To make the salsa verde, in a blender puree parsley, pepper flakes, garlic and 1/2 cup of the olive oil. Set aside. Place canola oil in a saucepot. Heat to 365°F. Meanwhile, in a small bowl combine flour and a pinch each salt and pepper. When oil is hot, dip rings in small batches, into buttermilk, hen into flour mixture to coat. Cook shallot rings in oil in batches until golden brown. Drain on paper towels. Season to taste with salt and pepper. In a bowl combine frisee, arugula and remaining tablespoon olive oil. Toss. Season to taste with salt and pepper. Divide tomato slices among 4 serving plates. Wrap each portion of cheese with the prosciutto to enclose the cheese fully so that the cheese does not seep out when you cook it. Heat a lightly greased skillet over medium heat. Add the cheese bundles and sear quickly on each side. Place a portion of salad on each plate. Top with the prosciutto-wrapped cheese. Drizzle with the salsa verde. Add some of the shallot rings, for garnish.